Every generation has its fallen hero and Britney Spears is ours. Yet despite being released at the height of her madness, 2007’s Blackout proved that Britney could still create brilliant pop moments. Now, just over a year later, Circus arrives with an overwhelming swell of public support behind it. 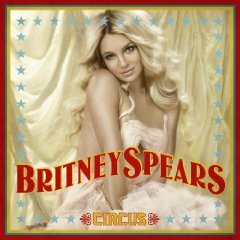 While Blackout was 45 minutes of eye-rolling, crotch-crunching, but utterly brilliant insanity, Circus is, like Britney herself in recent months, a touch calmer. Sometimes it works, like on the disconcerting ‘Unusual You’, an electro ballad of Robyn-sized proportions, or the serene ‘Blur’, documenting Britney’s last two years through lyrics like “I can’t remember what I did last night”. Other times, like on the sickly ‘My Baby’ – an ode to her children including a mawkish reference to their “tiny hands” – it goes horribly wrong. To be honest, though, all we really want from Britney is floor-filling pop to live up to ‘Womanizer”s manic sirens. ‘If You Seek Amy’ is a secretly filthy playful romp, while ‘Kill The Lights’ is a scathing attack on “Mr Photographer” who stalks her every move. Our favourite moment lies in the slow-motion middle eight of ‘Shattered Glass’: we can just imagine Britney, in full diva mode, strutting through a icy forest, completely back in control. Circus is an album of highs and lows, but there’s a danger we’re just so excited about Britney surviving that we’re happy to accept mediocrity. ‘Womanizer’ is probably the album’s only iconic moment, but it certainly proves there’s fight yet in the girl we’d almost written off for good. And, if we are going to be honest, the cover is not disimilar to Christinas Back To Basics effort. Ho Hum.